This week was filled with more working than cooking, but I did get a chance to try a great budget recipe from Every Day With Rachael Ray. I made Teriyaki Pork-and-Mango Stir-Fry. Darcy snarfed it up, too, so that is a testament to just how great it was. Amanda at Fake Ginger made French Onion Mac and Cheese from Every Day with Rachael Ray. Tracy of The Sustainable Scribe made Three Vegetable Penne with Tarragon-Basil Pesto (check out my review here). Looks like Rach went to Sundance this year. Scott of Eat with Me adapted Rachael's recipe for Steak & Pepper Hash to make his own Steak & Peppers with Cheddar Mashed Potatoes. 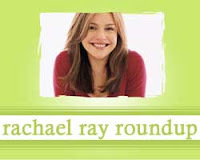 The Prudent Patron spotlights a great deal on Rachael Ray's magazine. Katie of The Cutting Back Kitchen made Mexican Lasagna. Robyn at Made in Brooklyn made Raspberry Linzer Danishes. Lauren of Thread by Thread made Lemon Ricotta Pasta with Sausage and Broccoli.